At Fairview Log Homes, our mission is to build quality, one-of-a-kind log homes while catering to the desires and needs of our clients. I love being home; I "fit" here! This is a home perfectly custom crafted to my personal tastes. Fairview's crew were very helpful in developing executable specs. I love being home; I "fit" here! Fairview as a company is just the right size. I feel I personally know the core staff and even some of their subcontractors. They were very directly responsive to any request throughout the build process. 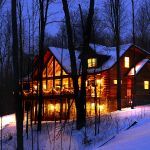 An artfully crafted log home on a fish-rich river, perfectly crafted to my personal, outdoorsy taste: what's not to love! We were so pleased with our first "Fairview Home" that we built a second one! With both homes, we looked at a lot of alternates but continually came to realize that nobody was more capable than Fairview. No one else could have cared more about building our dream home. The Fairview team met with us numerous times to make sure that all the details of our custom home were met. From dreams, to completed home, they were a pleasure to work with, and twice, they made the building experience enjoyable. You can't find a better team of individuals to build your "dream log home"! The building of our home by Fairview log Homes was a wonderful experience. The entire staff, especially Al, Tim and Sarah, were extremely caring and very personable. We have so many fond memories and pictures of the construction of our log home. They not only worked with us about the details of the construction or our home, but always went beyond what was expected. We have received so many compliments about our home. People often comment how warm and inviting our home is. When we decided to build our home, we had so many negative responses about building and many people said it would be a nightmare. That was not true at all. Not only was our experience positive and enjoyable, but we felt like Fairview bacame part of our extended family. We trusted them and we are so happy with the choice we made. The finishing is their trade mark! Three years ago we began planning our move up north. We looked at traditional homes but have always admired the log home style. One trip lead us to another family's home in the area, this was truly a traditional "family" home, build by Fairview Log Home. That same visit we met with Al Yoder at his office and we were sold on this style for our family. Prior to selecting Fairview we met with two other log home builders. Both were recommended by their owners, nice homes but neither compared to the workmanship of Fairview homes. The finishing is their trade mark! We sold our home and came north this past summer. After making all the house arrangments my husband left to service in Afghanistan. The ever vigilant Fairview Homes did not let him down. He recently came back to a home of his dreams - under the watchful eyes of Tim and Al Yoder. Not one worry or question went unanswered while he was gone. It was the most amazing process to watch. Each crew that came were absolutely easy to work with. They gave us the space to work on as much or as little as we wanted to in our own home. Minor changes were easily made during the build, their suggestions were improvements to the home without any financial surprises at closing. Fairview built the house within the time limit we were given, the price of the house was not inflated with over run costs and his office staff/crews feel like our second family! This is the first home we ever built and it is with great pride that we chose Fairview. We doubt there is any other builder that would compare to their staff and workmanship in our area! Pam and I designed our log home ourselves, then gave our plans to Fairview. 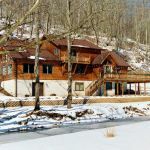 With only minor revisions necessary for structural integrity and to give us the floor plan we wanted, they built our beautiful log home in just under six months, right on time and right on budget. During the building process, if one of their work crew had an idea that would improve the beauty or functionality of our home, they would contact us to see if we agreed. We accepted virtually every suggestion, and as a result have a home that is not only pretty, it is also easy to live in and maintain. We would highly recommend Fairview Log Homes. They build beautiful, quality log homes and are a delight to work with. After 40 years of marriage and raising two sons, Jim and I were finally able to build the log home of our dreams. Although it is a second home, we spend every weekend there because we love it so much. Our best friend is a builder in Northern Ohio and he was so impressed with the quality of the workmanship and the materials used. As for Al Yoder, Tim Yoder and Sarah, every phone call was returned and every question was answered in a timely manor. We have build two homes prior to this log home, but it went so smoothly that we would recommend Mr. Yoder and his staff to everyone. Although their office is located two hours away from the building site, the crews were always there on time and kept things cleaned up as the work progressed. The ladies that came in to clean the house before they turned it over to us left everything spotless, and they were able to finish long before we expected. Again, we would ask you to contact Fairview Log Homes if you are considering building a log home.